Cast your vote in the comments for which dress Selkie wears to the aquarium! Yellow with stripes and bow, or purple with polka dots? Which dress says “I’s awesome ands your terribles” to you?! Also for those near the Chicago, Illinois area, just a reminder I will be in the Artist Alley at Anime Central this weekend! 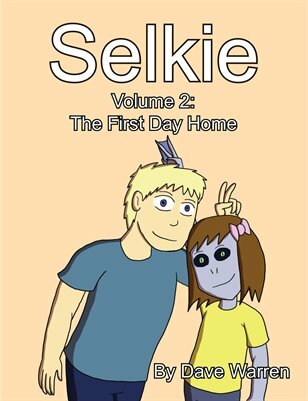 I’ll have some copies of Book 1 and Book 2 (book 2 also has a book-only bonus story) and I’ll be drawing and printing stuff all throughout the days. I’ll be at table G05! May not be a good idea to teach her the concept of weaponizing. Go with the yellow. She wears purple too often. The yellow looks a bit more like a fish (sunfish?) while the purple is a bit less interesting. I’d go with the yellow unless you expect to be stressed for time and want something easier to draw for several pages. Either one would take about the same drawn time, that’s not really a factor for me. Agreed. The yellow one for a party. That purple pattern would better suit a pair of PJs for her. I’d vote for the purple as it fits Selkie’s style. The Yellow One!!!! Lol I love this comic! The yellow one! It says I’m happy to terrorize you! I vote yellow, because it’s BRIGHT and has a bow on it. AWESOMES! Purple, all the way! The yellow is pretty, but the purple is both pretty AND looks like it would allow for a comfy swim in one of the fish tanks! *shifty eyes* Not that I think Selkie should chase ‘snacks’ around. Okay, I do. Yellow for sure, shows how happy she is. While I think the purple looks better on her, try the yellow one. It just looks so bright and chipper, so if she’s happy it’ll accentuate her personality. On the other hand, if she gets some news that makes her incredibly sad, a miserable kid in clothes they chose for happy reasons just looks so much sadder. Oh boy… I think Selkie is going to get direct proof of Todd’s line in panel 3 before the trip is done. Selkie, absolutely weaponize your clothes. That’s what clothes are for (aside from keeping you from getting pneumonia in the winter and arrested in the summer). Nothing says “Here I am, right smack in your face” like a yellow dress on a blue-skinned girl. A agree with Khlovia, wearing colours that contrast with your skin colour, is a bolder statement. The purple is just, “This is more of me!.” The yellow just pops! Yellow all the way. The colors really pop with her skin tone. Yellow 🙂 It looks more like a special dress, the purple one seems “everyday” wear for Selkie. A lot of critters in the jungle are very brightly colored. It can make them surprisingly hard to notice. It also typically means they are poisonous / dangerous…. I don’t really mind either way, but so far yellow is beating purple, so I’ll put my vote up for purple to give it a bit of a fighting chance. I’m also going to vote for purple. Yellow! While I like the color purple better, I love the style of the yellow dress. It’s ‘floofy’! Yellow (which because of some kind of optical illusion is actually blue). Yellow; the “bubbly” appearance of the purple can reinforce negative “fishy” associations. Yellow. The purple is an “I’m not really here” dress, while the yellow shouts “i’m here and I’m awesome! If I was Todd, I’d nix anything with short sleeves. I think it’s just for inside the aquarium, though. She can wear a coat over them. Selkie can double-up on her heat pads and thermal underwear, and throw a long-sleeve t-shirt over them (but under the dress) to match colors. That’s what she did when she wore the dress to the coffee shop. Yellow is fancier, for added awesomeness. Yellow with striped tights (maybe green and yellow—or a variation like that). 🙂 Purple is a great color on her, but it’s nice to shake things up and the yellow is very spring-like. Purple works better with her complexion. I’m tempted by the purple with blue polka dots, but … it’s nearly impossible for most people to wear yellow flatteringly, and purple (periwinkle! Sorry!) and yellow not only look really good together, but also have connotations of royalty. So, weapon-wise, the yellow one is probably a better choice. I vote for the purple. But the yellow is cute too. Yellow. The purple one isn’t a very “pretty” dress anyway. Now if Selkie had a RED dress – such a dress would be a power outfit. Yellow with bow! A pleasing contrast with her complexion and a more positive mood-inducer. Can I vote “None of the above” and write in a vote for the blue seal dress? It’s still my favorite. That or the dinosaur dress from Selkie #56. I can only get behind the dino-dress if she gets Mr. Ikaris nose/horn to go with it :-D. Otherwise: yellow. I was just like this when I was a kid. Gosh. Such memories. I vote yellow! Sunshine yellow is like BAM to the face. Screams I’m awesome. Also, I’ll keep an eye out at ACen! I’ll be a Wanderer from the game Journey! I’m excited to meet one of my favorite web comic artists! Throwing my vote in for yellow. Yellow, it has a cute bow. Also hoping Andy is having a similiar conversation with Amanda. First time commenter, long time reader, hello! I think the yellow dress is more striking! Yellow. Both dresses are terrible to my sense of style, but the yellow is more aggressive. The purple seems more a subdued and passive option. Def go with the yellow ditty. I vote yellow for the aquarium, but Selkie should keep the purple dress handy for stealthier missions (at least until she …acquires… invisibility technology). Also, yellow. Looks like it would pop. What more does Todd need to know. He knows the girl is named Amanda, that she was in the orphanage with Selkie and that she has a history of behavioural problems. The best he could do would try to reason with those in charge of her (at this point he doesn’t know he is one of them). You might want to find out more specifics about the type of abuse. It can change how exactly you deal with it. Though since Selkie’s already had two major incidents and those came to light immediately and had obvious effects on her, it may feel like “Well, she’s not having as strong a negative reaction to this girl, it seems more like a peer fight than a one-sided bullying thing, can’t be that serious.” Not sure whether that’s a fair assessment or not. While it seems I’m in the minority, I want to say the purple dress, because i feel like the yellow clashes with her skin. Yellow. Unless Selkie is planning to sneak the octopus out of the tank and eat it, in which case purple would be the stealthier option. yellow. the brighter color says happiness and the bow and frills say “look how prosperous my dads is.” a clear win in weaponization. I think the dress should be white and gold. I dunno, blue-black has a good air about it. I still can’t understand how people look at the picture presented and see the original colors of the dress. It’s like shining a red light on a white surface, taking a picture of the white surface without the red light in the picture, and then being able to see the surface as white when it’s clearly red or at least pink — it’s like your mind is cheating or something. After skimming the comments, I don’t think I need to vote. But I’m still going to say “Yellow!”. The other dress is too close to her skin tone and far to sedate in style to shout “Awesome”! If she were going to work or something, then that would be an okay (but dull) choice. But for happy-aggressive-awesomeness, you want a color that will make your complexion pop! Hm…yellow. Yellow is a power color. Purple is also a power color, but with the polka dots, it just feels like Barney. The yellow dress gives me more of the impression of a princess, with its bright color and bows and such. I like that she is starting to learn about how she should handle the meanness of Amanda. That it is alright to be angry, but she needs to handle it a certain way. Also, yellow dress, hands down. Gotta vote yellow; the purple is far too close to her skin shade, which is great if she wants to be a wallflower, (or look like she might be naked at first glance! had that happen when a school acquaintance was wearing a tight top almost the same exact shade as her skin – did not flatter her, since it made her figure look … weird due to the lack of contrast) not so great if she wants to exude confidence. I believe the yellows have it Dave. The yellow one looks much better! Dinosaur dress for the win (yeah, it’s not a choice, but I want to see it again 🙂 ).